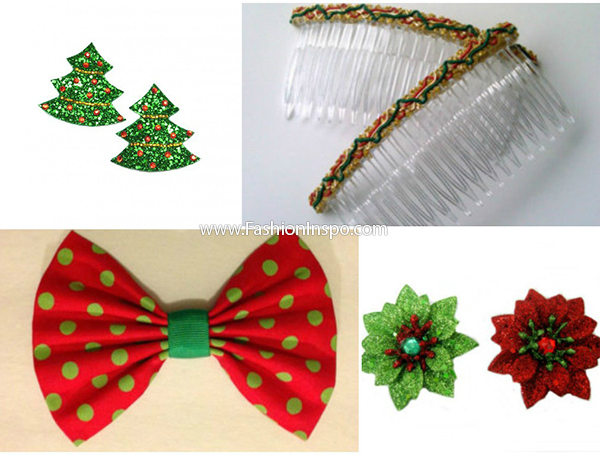 Here is another set of marvelous and incredibly beautiful accessories styled in a Christmas theme. Earlier you had a chance to take a look at awesome necklaces, earrings, bracelets, belts, clutches and scarves inspired by this magnificent and magic holiday. I am pretty sure that you have fallen in love with a couple (or even more) pieces and already have an intention to get those into your collection. Yet, there is no reason to hurry as here are more items to drool over. Below are the accessories that are likely to inspire and speak to you as much as the previous set did. Scroll down and get more of the Christmas mood! People tend to underestimate the true value and multifunctionality of a pin. This accessory is capable of changing the impression in a drastic way. Just imagine that you have a simple shirt in a moderate color and don’t know how to create a saucy and hot look without over weighting it. This is when a cool and lovely pin will play its rescuer role. Especially, if it is a mistletoe shaped pin in gold that features tiny red and green rhinestones along with cute bow on the top. Trust me, such an item will make any of your outfits look more exquisite and alluring, while the petite accessory will draw more attention to your outstanding personality. A cute hat or cap is a decent accessory that will make any of your looks more complete and catchy. Especially when it is winter time that we are talking about. When, if not during the cold season can we show off our extensive and lovely collection of headwear? If you were looking for something to add up to this collection, then it has to be a Christmas inspired piece. 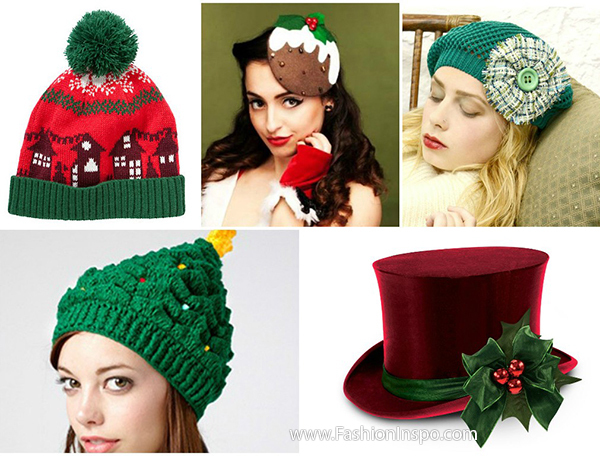 You have a choice to go for an adorable green knit beanie with red, white and yellow beads and a cute pom pom on the top. Or else, why not to opt for a a more sophisticated cylinder hat in oxblood red with dark green embellishment? Tights have proven to be a very important element of our wardrobe. We tend to rock it all year around, regardless of temperature and occasion. 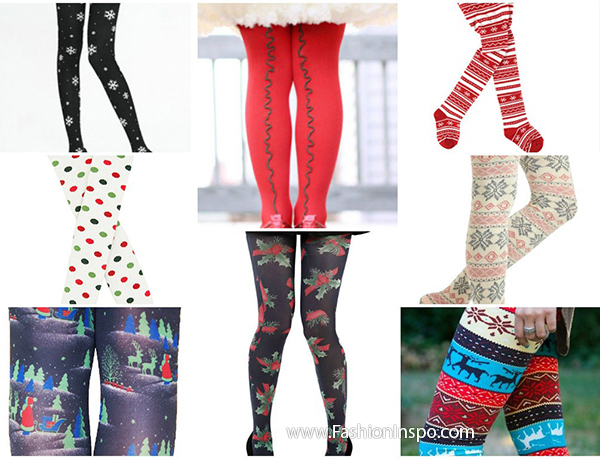 Sporting a cool pair of tights designed in a Christmas style will definitely add up to any of your looks. There are so many options available now, so it should not be too hard for you to find a saucy item. Red nylon ones with a green zigzag line along the back as well as the navy tights with a green and red print will do equally well. A beautiful watch is something every lady should have in her closet. And it definitely should not be just one piece. The more you have, the easier it will be for you to create complete and saucy outfits. 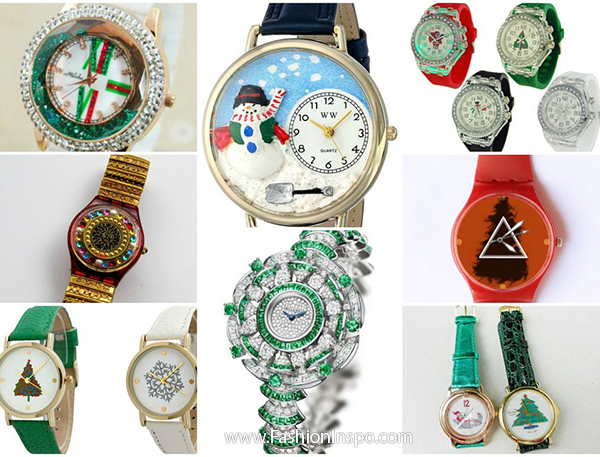 Be it a silver metal watch encrusted with white and green rhinestones, a carrot red piece with an black outline of a Christmas tree in the middle or a dark blue one with a snowman printed on the hourplate, you will notice the exquisite and unique zest that it gives to your look. Various hair pieces are capable of turning even the most regular and boring hairstyle into a masterpiece. If you have not decided upon your Christmas hairdo yet, this is quite the time to do so. Whatever you go for, keep in mind the wide range of available pieces that will embellish your hair and make you stand out from the crowd. 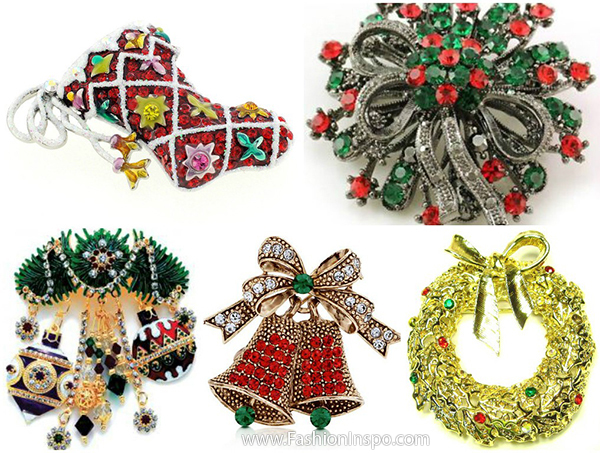 Hair clips shaped and embellished as sparkling Christmas trees, silver picks with green, gold and red trimming or a cute bow clip in red and green looks incredibly cool and appealing. Last but not least comes a set of extremely beautiful and stylish rings that each will blow your mind away. If you are a fan of petite but impressive and catchy accessories, then this should be your final stop. A striking reindeer shaped ring in copper or a funky one with a printed Santa Claus’s face will by all means make your evening more fun and joyful. Besides, such an item will definitely complete any of your outfits and add a touch of individuality and creativity. 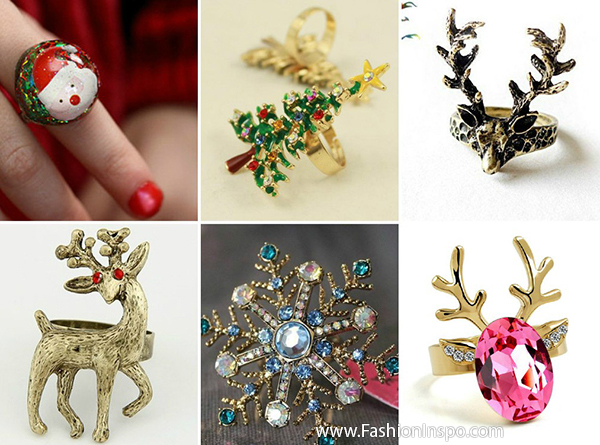 These were the most stunning and worthy accessories styled in a Christmas theme. Feel free to go for any of the presented pieces or even several of them. After all, it is the most magic and enchanting holiday of all the existing ones – so there should be not limitations or rules.